FANBOY PLANET.com . 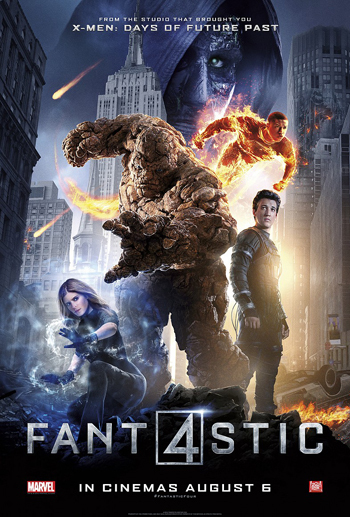 : Fantastic Four 2015 :. A good superhero movie is like a puzzle. 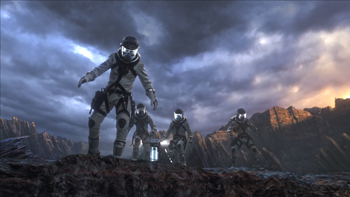 Fantastic Four has all the pieces (and probably a few extra), but 20th Century Fox and director Josh Trank seem to have lost the box. They have no idea what the picture is supposed to look like. At first, this reboot looks like it's going to be an '80s Spielberg family film, with troubled kid inventor Reed Richards (Owen Judge) declaring that he will build a teleporter. 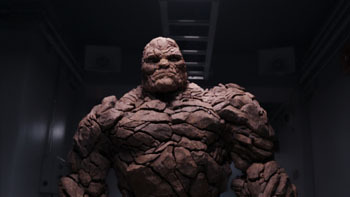 Only the bullied Ben Grimm (Evan Hannemann) sees potential and kinship, and we should have a great adventure. And then it switches gears into more of a Young Adult adventure, where a group of genius teens under the tutelage of Dr. Franklin Storm (Reg E. Cathy) are working to crack interdimensional travel to Zero World -- because that's where Reed has been teleporting little toy cars, and where the smartest of them all, Victor Von Doom (Toby Kemmel) had theorized they could go. Certainly not to the Negative Zone, because why actually use the terminology that fifty years of comics had inculcated into fans? So it's a science fiction adventure, right? Except that maybe it's really a horror film, where the teleportation experiment goes horribly wrong, costing the life of one team member (except of course he'll come back -- they always come back) and mutilating the other three. Oh, and Sue Storm (Kate Mara) is also altered, even though in this version, she actually doesn't travel with Reed (Miles Teller), Ben (Jamie Bell), and Johnny (Michael B. Richards). Somehow they just carry the energy back with them and it grants her powers. Then it becomes a bit of a military thriller, as a year passes with the military using Ben as a weapon, training Johnny to become one, and Reed on the run, disguising himself in South America and trying to cobble together the technology to save them all. The powers, by the way, are all treated as curses, and Reed and Johnny both need containment suits with special controls in order to make them work. Hence all the valves on Johnny's suit and the coils on Reed's -- neither of them can turn their powers off mentally. Appropriately, perhaps, Sue seems to have much greater control. Naturally only Sue resists being put into active combat, knowing that if she allows herself to become a soldier, the government will never really try to cure her. Which is kind of odd since she is the only one of the four who can still pass for normal. And if you've gotten this far and you can't see how awfully close this movie seems to veer toward being right, and is yet so wrong, well, you might understand the thought processes of the creative team. So the pieces that show respect are there. Ben Grimm is quietly shown to be Jewish, though it doesn't really come into play. It's a nice touch. Johnny Storm is a hothead and into cars, brought in to work off a debt to his father. It works. And Reed seems befuddled by things that normal people like, but can't deny that he has an attraction -- not acted upon here -- to Sue. They're in the Baxter Building, and there's even eventually a reference to Central City, though it's in a forced epilogue that has to have been part of the fabled reshoots, in which someone shouted, "hey! We forgot to make this the Fantastic Four!" If you can get past the redesign and the utter lack of motivation besides he was established as a jerk, Kemmel's portrayal of the character isn't wrong. It's just not given an anchor. When Victor becomes Doom, it's the harshest side of the character without any of the fun that a megalomaniac can bring to the screen, and in the best portrayals of Dr. Doom, there should be a sense of tragedy -- how great he could have been if not for his arrogance, how maybe he and Reed could really have been good friends if not for that. Again, at the edges, you can see how maybe in one version of this script, it might have all been there, but now it's not. And that iconic moment when the four agree to use their powers for good -- it's rushed, it's cheesy, and in that epilogue, it's actually so on the nose it hurts. We wanted Fantastic Four and Fox wanted to make Unbreakable. Except a lot of people love that movie. None of this can be blamed on the actors, though there are a couple of miscastings. Mara makes a much better Sue than Jessica Alba did, for sure, with the right edge of toughness and a performance that makes it clear Sue is often the smartest person in the room and often people don't notice it. 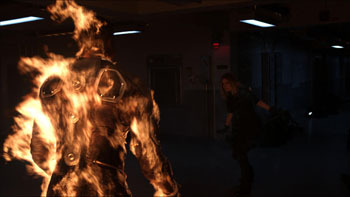 As Johnny, Jordan does build an arc that makes it believable that he would want to be a soldier -- it's not the way we know The Human Torch, but it works in the context of this plot. As their father, Cathy hits all the right notes. But Kemmel is just not given enough to chew on except to sulk, nor is Teller given much else but to be self-righteous or befuddled. Post-production couldn't seem to decide on a consistent tone for The Thing's voice, and there's nothing really imposing about Bell either physically or vocally, no matter how good an actor he is. As for the puzzle, the pieces are all still scattered on the table. If Fox really is going to move forward -- whether out of spite to Marvel at this point or not -- the cast could stay, but the team really has to decide what they want the picture to be. And here's a hint, guys: how about just giving us the Fantastic Four? FULL DISCLOSURE: My son overall liked it, but was disappointed by the lack of real Fantastic Four costumes (and that they had to use them to control their powers), and that there wasn't nearly enough Doom. So... yeah. He wanted more of it to really be the Fantastic Four.